Offworld Trading Company - 25% off all weekend! Hooray, it's a sale! Offworld Trading Company is 25% off -- $29.99 -- all weekend. Mars is the next frontier for ambitious men and women to make their mark on humanity, but the battle for control of the red planet is fought with stock buyouts and short sales rather than missiles and tanks. Civilization IV designer Soren Johnson's next game is an economic RTS that challenges the foundational assumptions of what the real-time strategy genre can be. Join the Offworld Trading Company Early Access beta for 25% off here. 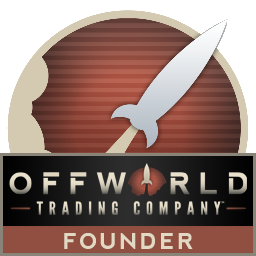 This weekend on Gamersgate, Offworld Trading Company is 50% off!